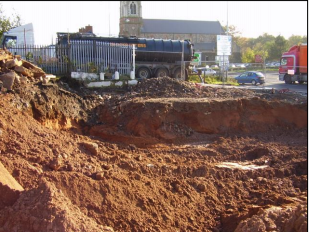 The Envirotreat® E-Clay Technology was utilised to remediate contaminated soils at a site in Lisburn, Northern Ireland. The site approximately 640m² was previously occupied by a petrol filling station and vehicle service / repair garage, with associated underground fuel storage tanks. Prior to remediation works, these were decommissioned and removed from the site. Site investigations had identified the presence of elevated concentrations of hydrocarbons in the soil, comprising both diesel and gasoline range organics. The soil contamination was identified to depths of 3m below ground level within the central area of the site covering approximately 160m². The overall remediation strategy was designed to address source and indirectly pathway contamination issues, with the intention of protecting both human and groundwater receptors. The remedial operation involved the ex-situ treatment of the identified source contamination material. Post remediation it was anticipated that the site would be development for residual development. Plate 2 – Area of primary contamination. Envirotreat employed an on site, ex-situ soil mixing strategy to treat around 735m³ of contaminated soils at the site. The works were conducted over a period of 3 weeks under the auspices of Envirotreat’s Mobile Process Licence (MPL). Specialist technology, materials and supervision were supplied by Envirotreat, whilst RAW Consulting Ltd supplied the required plant and labour for application of the process. The soils were mixed in 5m³ batches to allow known quantities of contaminated soils to be combined with the E-clay® slurry until a homogenous mix was produced. The treated soils were then temporarily stockpiled before being reused on-site as a substitute for imported clean fill, thus negating the need for off site disposal. The ex-situ treatment of contaminated soil enabled compliance with the identified Site Specific Target Levels through the immobilisation of leachable pollutants within the soils. The treatment operation was designed to fully recover the waste soils in order to produce a raw material suitable for use on site in accordance with predefined and agreed criteria. Once treated, the recovered soil were emplaced and compacted, for site levelling purposes. Validation of the recovered soil was carried out by Envirotreat whilst validation of the excavations was undertaken by RAW Consulting.